It all started off pretty happily. Little Z was very excited to be going to “nursery”, just like his big Cousin A and had been asking and asking and asking for weeks if he could go too. I think I was the more nervous one. But it was just induction for a couple of hours so it couldn’t be too bad really. Could it? We arrived at our allocated time and a kind faced girl came to open the door, gave Little Z a big hello and announced to the both of us that she was going to be his keyworker. She was absolutely lovely and I took an instant liking to her. I relaxed even more when I saw how she drew the little kids towards her like little magnets with one in particular showering her with kisses periodically. Little Z on the other hand decided he felt very dubious about the whole pre-school thing and didn’t relax or take his coat off for about half an hour. Once he looked settled the plan was for me to sneak off and come back after an hour to help him start to get used to it by himself for a short burst. I failed at the slick exit quite spectacularly as Little Z busted me and instantly bawled for me not to go. I kept telling myself it was only an hour and it would be fine and marched out of the building as fast as I could. In hindsight I probably should have stayed with him the entire time and saved the “leaving test” for the second session. I have to admit the urge to find a window for spying was pretty strong as was just sitting in my car for an hour and I did half wonder if mums, in time gone by have actually scaled the building looking for a good spot to just watch their child. The Other Half and I both went to pick him an hour later and he was happily playing on the indoor slide with a couple of other little boys. Apparently he cried for about 20 minutes (which, to me, is long!) but was fine after that although he kept checking his lovely keyworker was still in sight. He abandoned the slide as soon as he saw us and declared we should “go home now”. His keyworker kept emphasising how well he had done for his first day and we were semi assured that it wasn’t a complete disaster. He jumped into his car seat at lightning speed and announced he was never coming back. So, if I’m honest it didn’t feel much like a magic moment. As he’s only going twice a week it feels like the whole settling in phase is going to take a long time. I know in time I’ll look back on his first day as a sweet moment and a big milestone but right now it all feels a bit meh! Hopefully this week might be a little better. This entry was posted in Toddler and tagged first day of nursery, nursery, pre-school. Bookmark the permalink. I hope this week goes a bit better. Settling in can be tough for some children. All of my kids did two full days at nursery from six months. Until the day he left, my eldest cried on drop-off, but he was fine all day. The other two were fine with nursery, but my daughter couldn’t settle at playgroup and I had to stay with her for the first three or four sessions. But they all grow to love it in the end – they get a real sense of belonging and independence – and they make some lovely friends. Good luck, it will be fine! My daughter was the same at her first session and had a few tears but was happy to play. The next time I took her she did say in the car not to leave her again and to stay and play. With a bit of reassurance from me & explaining i had “busy jobs” to do so pre-school would be more fun for her she was fine. Ah I do remember what that feels like letting your baby go off for the first time. Its been awhile for me but it does get better really lol. Before you know it you will be so used to it and everyone will settle down. I have done the pre school, off to university , getting married the empty nest lol the lot and I am still going . Mumof2.com recently posted…Double Trouble – it was her! The Boy only went twice a week as well and it did make the settling in process a bit longer, but it’s a necessary evil for both you and him. Before you know it he will be looking forward to going and playing with his friends in nursery. I can’t believe The Boy is halfway through his first year in school! Oh bless him and you. I didn’t have any trouble with my Z going but I had a hard time with C. She only went 2 days a week for her first year at nursery. She would get upset when I’d leave her but she did eventually settle when she made some friends. I hope it doesn’t take him too long to get settled in. It’s not a nice feeling thinking they are missing you or not having fun. LauraCYMFT recently posted…Jump Horsey, Jump! JJ’s nursery (when he was two) actually had full length glass windows to the corridor (but kind of obscured from the inside) so I was able to see that, even though he cried when I left, he stopped almost immediately after I walked out of the door! I honestly think they just do it to make us feel guilty! Sam recently posted…A morning of water sliding! Aww it’s so hard when they cry isn’t it and you fell so blooming guilty for leaving them but it is such a great experience for them and they learn so much that it is worth it. Trust me, before you know it he’ll be running in to play so quick you’ll be upset that you didn’t get proper goodbye hug! Lou’s Lake Views recently posted…Cold – What’s the story? Uh oh, indeed! Schooling is my biggest worry too, and I hope your little guy changes his mind next time! The first time is always difficult for the both of you with so many mixed emotions to manage. The wee man has been at nursery since he was 9 months and still ranges between days where he is happy to go in to hanging on to my leg and when he rushes up to me for a big cuddle at going home time or shouting for me to go away and he does not want to go home! It will get easier for both of you I imagine and if you were getting positive vibes from the staff that is important as it will probably be a positive learning experience for him. It does get better – in the meantime there’s always biscuits ! Oh Tas so tough! For what its worth though it all sounds completely normal and he will get used to it and love it in to time i’m sure. Rest assured it will get better, Tas. Another few weeks and he will want to go every day! awwww i cant believe Z has had his pre school induction already!!!! eeeeeeek!! i know he has declared that he does not want to return but it will be ok…….in the end!! 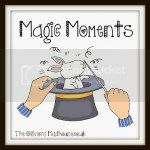 older mum in a muddle recently posted…#Once upon a time – Alchemy. Part Two. Things will get better honestly. We spend our lives making our kids feel safe and secure so it’s normal and shows we’ve done a great job that they don’t want to flee from us the moment they get the chance (however wonderful the setting)-Oliver was the same and we found starting off with 2 days a week was better than half days, he settled in quicker and loved it. Alexander hasn’t started nursery yet as my folks help but he will in September (much harder for us than them). Sending hugs! AWww. It will get better. I promise. Aw, a big day for the wee one, and for you! @katgrant30 aka Bumps and Grind recently posted…Word of the Week: GIGGLES! Kim Carberry recently posted…My Word of the Week!! Ah, bless him. I’m sure he will settle soon. I broke my heart after leaving Bud for the first time at nursery and still have wobbles now, even though he’s been going for seven months! I don’t know how I will cope with Reception! I am sure it will get better! Hope it improves. We found it a long hard struggle, but he did get there in the end – I’m sure Z will too.